Across the world, the vast majority of people strongly prefer to use their right hands for tasks requiring dexterity and strength, such as using tools – something which is not the case in our closest relatives, chimpanzees. Right-handedness seems to have evolved in ancestral humans at the same time as language, and both are controlled by the left brain hemisphere – perhaps because both tool use and language require complex sequential processing. New Caledonian crows also have lateral preferences. 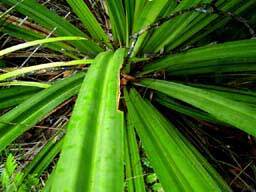 Across the whole population, the crows seem to prefer to make tools from the left edges of Pandanus leaves, which involves using the left-hand side of their bill (see Crow natural history) ( Hunt 2000; Hunt et al. 2001). We now also know that individual crows have a preferred way of holding tools when using them. The crows either hold the end of a tool (a bit like smoking a cigarette! ), or (more often) grasp the shaft of the tool part of the way along it, and hold it with one end pressed against the side of their face. Each individual almost always holds tools in the same orientation. However, unlike with crow tool manufacture, there does not seem to be a population bias: equal numbers hold tools pressed against their left and right cheeks ( Rutledge & Hunt 2004; Weir et al. 2004). This division of labour between brain hemispheres may allow the coordination of many more processes than could be achieved otherwise. That New Caledonian crows, like humans, show behavioural laterality in their tool use suggests that their brains may share more features with our own than previously imagined. Detailed analysis of their brains will help determine whether this similarity is coincidental, or if it is an evolutionary solution to the same mental challenges (see Neurobiology). Weir, A.A.S., Kenward, B., Chappell, J., & Kacelnik, A. (2004). Lateralization of tool use in New Caledonian crows (Corvus moneduloides). Proceedings of the Royal Society of London B (Suppl.) 271: S344–S346. DOI 10.1098/rsbl.2004.0183. Download a [PDF] here. This QuickTime™ (.mov) movie (Important: you need version 5 or later) shows a male, "YY", using a tool left-laterally. Note how he adjusts his grip on the tool during the trial, presumably to increase precision. For more movies, see Photos and Movies. 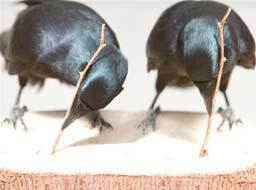 Nature News - "Crows switch sides to use tools"